Heads have emerged and flowering has begun or will soon begin for most of the winter wheat and winter barley crops in New York State. This is a critical time for assessment of disease risk and for making a decision to apply an effective triazole fungicide, i.e., Caramba, Prosaro, or Proline, for suppression of Fusarium head blight (FHB), reducing the risk of deoxynivalenol (DON) contamination of grain, and protection of flag leaves from foliar diseases. The Fusarium Risk Assessment Tool (http://www.wheatscab.psu.edu/) currently projects a low risk of FHB infection, but this could change as warm, humid conditions with scattered showers are forecast through this weekend. The extended forecast through the early grain-filling period calls for above-normal temperatures and precipitation that could favor development of fungal foliar diseases that are currently at low levels. There is an application window of approximately 5-6 days from the beginning of flowering (Feekes 10.5 in barley and Feekes 10.5.1 in wheat) in which reasonable FHB suppression can be expected. Last week temperatures ranged from 3 to 6 degrees below normal for most of the state. Precipitation ranged widely from 1 inch up to 4 inches. The base 50 growing degree-days ranged from 25 to 50. Hot weather & storms before returning to seasonal temperatures. Possible severe storms on Sunday. Today will be mostly sunny and hot! Temperatures will be in the mid 80’s to near 90 with a slight chance for afternoon showers or thunderstorms. Overnight temperatures will range throughout the 60’s. Friday will be mostly sunny and hot again; temperatures will rise into the upper 80’s and low 90’s with a chance for thunderstorms. Overnight temperatures will range throughout the 60’s. Saturday will be partly sunny with highs in the mid 80’s to near 90. Light rain and thunderstorms are possible in the afternoon. Lows will be in the low to mid 60’s. Sunday will be mostly cloudy with highs cooler but still above normal, in the mid 70’s to low 80’s. Showers and thunderstorms are likely as a front passes, some possibly severe. Overnight lows will be in the mid 50’s to low 60’s. Monday will be cloudy and notably cooler, but seasonable, because of the frontal passage. Highs will be in the upper 60’s to mid 70’s with light rain possible. Monday night will be in the upper 40’s to mid 50’s. Tuesday will be mostly sunny with highs in the upper 60’s to low 70’s. Lows will be In the upper 40’s to mid 50’s. Wednesday will be in the upper 60’s to low 70’s. Lows will be in the mid 40’s to near 50. The five-day precipitation amounts will range from ½” to 1 ½” . The 8-14 day out look (June 6 – June 12) is showing above normal temperatures and above normal precipitation. Abnormally dry area reduced, still includes areas of Catskills, low Hudson Valley Region, Hamilton and Herkimer counties. The Capitol Area Ag Report for May 29, 2013 is now available online. Click here for the most recent issue. Thursday June 6, 2013 The Program will run from 10:00am-12:00noon, registration begins at 9:30. 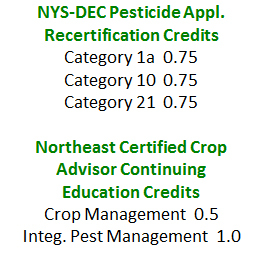 An educational program of the Integrated Field Crop, Soil, and Pest Management Program Work Team in conjunction with Cornell Cooperative Extension with support from the Cornell University Agricultural Experiment Station. The summary for the fourth and final week of our first cutting monitoring can be found here. If you are not familiar with our procedures we use alfalfa height to predict Neutral Detergent Fiber (NDF) for alfalfa, alfalfa/grass mixed and grass stands. 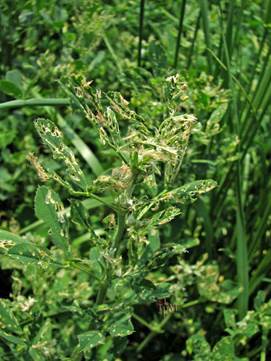 Alfalfa height has proven to be a reliable indicator of NDF values in the field. Hay Harvest is in full swing! Lots of excellent quality forage was put in last week. Grass and legumes continued to put on good growth with grass growing almost 6½ inches and legumes just over 4 inches, on average. Only one field sampled was observed to be headed, but we would expect most others to begin heading this week. Just over half of our sampling sites were harvested since sampling on May 14. As of sampling on Tuesday, the remaining grass fields have reached the low to mid 50s NDF, still within the range we would consider good quality, but with the expectation of NDF advancing 0.75 – 1.2 points per day will pass the optimum range this week. Mixed grass/legume fields are also at or passing peak quality, while mostly legume fields are just reaching optimum quality. Second cutting is re-growing rapidly. We recommend harvesting 30-35 days after cutting for peak quality. For fields harvested last week that would be week of June 17. The data table below has each sample location, listed by Town and elevation, his year we have added a farm name as well. Data include the species sampled, average height, neutral detergent fiber (NDF) and 24 hr. NDF Digestibility (NDFD). You can get a pdf of the complete report here. We have also updated the Google map of our sampling sites with this week’s results. Check it out. We will sample again on May 28, and send a report on or about May 30. Winter wheat in much of New York State is at the flag leaf emerged to boot stages of development and heads will emerge over the next week. Heads have already emerged in warmer regions of the Hudson Valley. The next 14 days will be critical for farmers making fungicide spray decisions for suppression of Fusarium head blight (FHB) and protection of flag leaves from foliar diseases. The triazole products Caramba, Prosaro, and Proline are the most effective fungicides for suppression of FHB and deoxynivalenol (DON) toxin contamination when applied at wheat flowering (emergence of anthers on heads). A flowering application of triazole fungicide should be based on Fusarium head blight (FHB) risk as well as the risks of powdery mildew, rust, and fungal leaf blotches in the upper canopy based on scouting of individual fields. There is an application window of approximately 5-6 days from the beginning of flowering in which reasonable FHB suppression can be expected. Fungicide products containing strobilurins should not be applied to headed wheat as they may result in increased levels of DON in grain. The forecast over the next several days is for cool weather that will slow development of Fusarium spores in the region. But the extended forecast for the final days of May into early June calls for a warming trend with significant chances for precipitation. Check the Fusarium Risk Assessment Tool (http://www.wheatscab.psu.edu/) and your local weather forecast frequently as your crop approaches flowering. The third of our first cutting forage quality summaries is available here. Our last report will be next week, May 28. Last night’s rains may slow down harvest but given how dry it has been I think we will gladly take it.